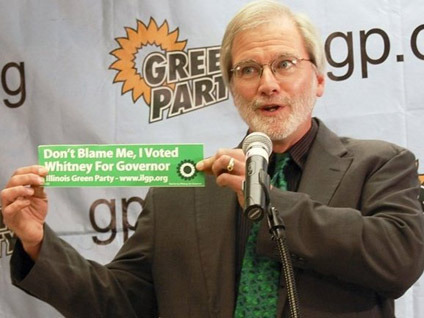 Chicago Ballots Identify Candidate Rich Whitney as "Rich Whitey"
It's the typo to end all typos: Illinois gubernatorial candidate Rich Whitney's name is misspelled as "Rich Whitey" on some electronic-voting machines in Chicago, and officials say the problem can't be fixed before election day. The Chicago Sun-Times, which broke the story, notes that half of the flawed machines are in predominantly African-American areas of the city. The problem is present in 23 of Chicago's 50 wards. "I don't want to be identified as 'Whitey.' If this is happening in primarily African-American wards, that's an even bigger concern," Whitney, the Green party candidate, told the Sun-Times. He added that the typo could be the result of "machine politics" and said "this has to be disconcerting to a voter," though he added he was not sure how it will impact the vote. A Rasmussen poll out today found Whitney taking just two percent of the vote. The survey found he trails Republican Bill Brady with 46 percent, Democratic Governor Pat Quinn with 40 percent and independent Scott Lee Cohen with 4 percent. Whitney's name is actually spelled correctly on initial screens on the electronic voting machines but then becomes "Rich Whitey" on review screens. City officials say they do not have sufficient time to reprogram the machines, though Whitney is reportedly considering legal action to try and force them to address the matter.